From the small village of Bihar, India to Melbourne, Melbourne to Darwin, and Darwin to Fiji, the culinary journey for Chef Prabhat Prawin, Executive chef for Sheraton and Westin Denarau complex Fiji has been a big learning experience. Born in a small village near Patna in India, Prabhat studied hotel management at IHM, Bhubaneswar as well as gained a culinary diploma from William Angliss Institute, Melbourne Australia. Chef Prabhat, has worked in leading five star hotels in India, trained and worked with Michelin star chefs and has had the experience of working for Rydges Hotels and Resorts, The Hotel Windsor, Park Hyatt, Crown casino in Melbourne where he relished an opportunity to cook for celebrities, high profile guests and high rollers. Then moving to Darwin to take a new culinary adventure, joining as a cluster Executive Chef for two of the IHG’s Darwin properties. These hotels were rebranded as Doubletree Hotels. Prabhat was part of the introduction of the Doubletree brand in Australia. Shortly after joining Sheraton Denarau Fiji complex as an Executive Sous Chef. Chef Prabhat was promoted in January 2017 to Executive Chef. Specialising in modern Australian cuisine, which is influenced by French cooking techniques, Chef Prabhat loves to push the boundaries with his modern food creations. 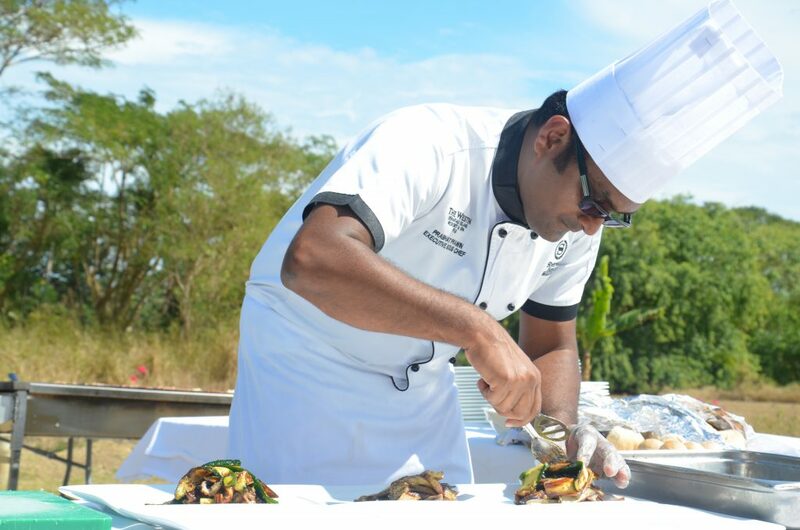 In his role as Executive Chef at Sheraton and Westin Denarau Complex, Fiji he is in charge of 14 restaurants, with his talented Expat and local chefs. Chef Prabhat has claimed the ‘Best Fine Dining’ title in Fiji with his influence in the Ports O’ Call restaurant. Can you tell us more about yourself, where you grew up and what inspired you to become a chef? I was born in the northeast part of India. My family background is in farming and we grew a lot of vegetables that we used in an organic manner. Even then we were passionate about fresh produce, but I did not get really passionate about food until I went to college to study hospitality. In India there is a hospitality course where you study everything about hospitality, from front of office, sales and marketing, housekeeping, basically all departments. After this course I had the opportunity to do the Diploma in Hospitality in Commercial Cookery at the William Angliss Institute in Melbourne, Australia where I learned more about international sales and Western food. I started my career in Melbourne from working in different restaurants to managing 45 high-end restaurants, and then working for Rydges Hotels and Resorts, The Hotel Windsor, Park Hyatt, and the Crown casino. From Melbourne, I moved to Darwin to join IHG and then in 2016 I had the opportunity to come to Fiji here in the Sheraton Denarau Fiji complex as an Executive Sous Chef. I am now the Executive Chef where I am in charge of all our 14 restaurants. Tell us about the Farm to Fork program at the Westin. When did it start, who thought of this initiative and how popular is it? Our 14 restaurants all have different concepts, and when I got here I was thinking, how can I do something different? We already had a 2.5 acre farm here close to the golf course where we grow our own produce. And it is organic as we do not use any chemicals. 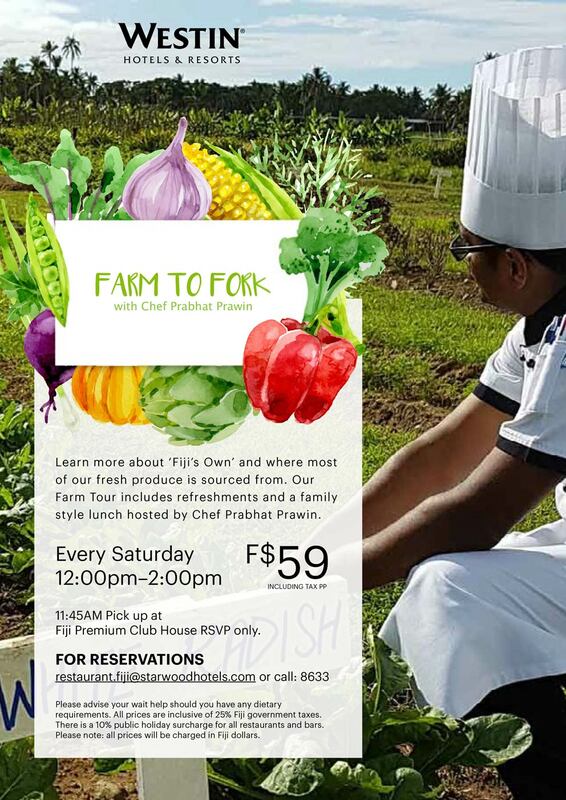 I thought of the Farm to Fork initiative which we started in 2016 where we can talk to our guests about the uniqueness of food here in Fiji, discuss the challenges we have and show them our produce after which they are served a buffet lunch consisting of fresh salads, grilled meats, and finishing off with some fine dessert. The initiative is quite popular. We can only have a maximum of 40 guests per trip because we want to connect with everyone and keep the experience quite personal. Are you working with local farmers in Fiji as part of this program? Yes we are. We currently have 5-6 different farmers who also grow produce for us. We give them guidelines and a forecast so we tell them what we need and how much we need. Recently, we have started involving more of our farmers by getting them to meet our guests. For example, we now have our pineapple farmer from Lautoka who comes to breakfast to talk about his pineapples and serve them to our guests. I think this is good because he can then understand and appreciate who is eating what he is growing in his farm. In this way, the farmers we partner with, get motivated to see guests eating and complimenting the food and their fresh produce.